The origins of Jouef are both obscure and humble. Georges Huard made fancy goods in the Franche-Comté region of France, near Dijon. Plastic and metal household utensils were then his stock in trade. Toward the end of WW2 in 1944 he set up the 'Le Jouet Français' (The French Toy) company and produced his first toys in tinplate, which he originally registered under the trademark of JF and which became known as Jouef around 1950. Production of the household utensils continued until around the beginning of the 1960's, but they rapidly became incidental alongside the growing success of Jouef trains. The headquarters and manufacturing base of the company was located in Champagnole, France. The range of tinplate Jouef toys was not very large. It remained neglected and there were no official catalogues of what was available. It is thought that the range included several models of planes, cars, both motorized and push-along (a very simple Panhard Aronde, racing cars, a Delahaye, etc), a surprisingly futuristic 'aile volante' (flying wing), several small boats, a cooker and a range of saucepans and a pair of clockwork boxers (the 'Boxing Boys'). But Jouef also made sophisticated toys like the racetrack sets with clockwork cars (known as 'La Panaméricaine' and 'La Panabifur') and a large electrically driven racing car made from aluminium. There is no official record of any trains being produced by Jouef before 1950. 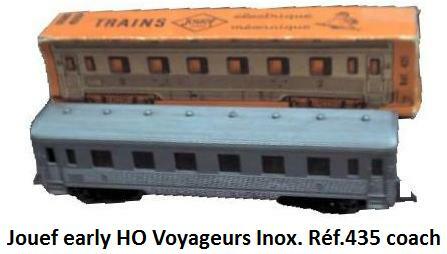 At this time the first catalogue showed the 'Algiers to Timbouctou' railcar, the celebrated 'Trans Saharan', in lithographed tinplate. However certain experts claim that this train appeared between 1947 and 1948. The history page on the current Jouef web site claims the model made its debut in 1949. It was a perfect example of a traditional nursery toy: not a very accurate model, exotic (the silhouettes shown in the windows wore conventional Algerian costumes) but to no particular scale. The first examples of the 'Trans Saharian' were equipped with a crude elastic band propulsion system, which performed equally well either on or off the rails. 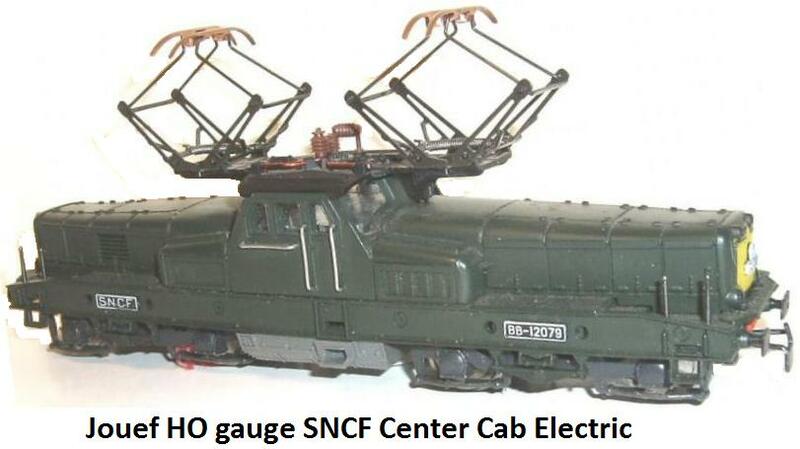 In 1955 an electric powered version was issued in HO gauge. By using tinplate, Georges Huard had without doubt produced a toy in a million. 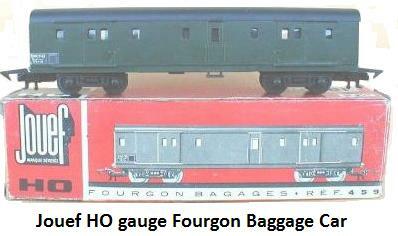 But, by brilliant intuition or happy chance, due to the economic worries about raw material, Georges Huard chose 'OO' scale (later called HO), which he persuaded the designers to use rather than the prevailing 'O' gauge which ruled supreme amongst the toy train manufacturers of the day such as JEP, Hornby and CR (Charles Rossignol). During the 1950's Jouef gradually turned to plastic for the manufacture of their toys. Little by little tinplate was abandoned as the technicians sought to reduce the metallic content of the toys. From that point on, the bodies, chassis and the gears were made from plastic, a material much cheaper than the zamac and brass used almost exclusively by JEP, PMP, Rateau, Martin, VB and SMCF. Plastic finally proved to be the ideal material for reproducing accurate models from metal molds or dies. This revolutionary technique allowed Jouef to produce models which were more and more realistic at an unbeatable price. In 1965 the catalogue included goods wagons priced at 3FF (0.5 Euro) each and very accurate locomotives for only 30FF(5 Euros) which were half the price of the contemporary Hornby models, which had metal chassis and bodies. Plastic was first used in 1952 on the clockwork 'Diabolic' steam locomotive, loosely based on a Pacific. For the first time the body and tender (including the wheels) were made in black plastic. However, tinplate had not had its day. It was used that same year for several coaches which, until the end of the 1950's, were available with the 'Diabolic' in the 'Paris-Rome' and 'Circuit 50' train sets and their derivatives. But plastic was constantly gaining ground. In 1954 Jouef used it for its first goods wagons. It was also used in 1955 for the first Bo-Bo electric loco BB9003 which quickly became BB9004 after the prototype became the holder of the world railway speed record and for stainless steel passenger coaches (Inox) in a short version with only six windows. At the same time Jouef also adopted plastic for its nursery toys. In addition to the inevitable racing cars and small boats the company showed its originality by producing a helicopter and a series of agricultural models under the name 'Agraires Baby'. They later produced horses and various models of tractors with associated wagons altogether in a set 'The Model Farm'. The packets of model horses, a pinball machine and various clockwork characters in celluloid are very rare today. Jouef also tried to find an opening in the technical field. They marketed a scientific toy called 'Transtronic radio' which allowed young boys to make a true transistor radio. Also worthy of mention is the superb "Electromatic" service station which combined an electrically-powered 'VersaiIles' car and petrol pumps concealing a large battery charger. But these were yesterday's toys, by the end of 1950, Jouef already had the lion's share of the toy train market with its clockwork train sets and its 6 volt electric models. The BB9004, the BB9201 and the small freelance 0-4-0T steam engine - over 2,000,000 examples of which were eventually produced between 1956 and its removal from the catalogues in 1993 and which was produced again in the summer of 2000! - constituted the basis of a range which remained however, according to the 1963 RMA catalogue "the children's train, an inexpensive introduction". George Huard was already on the way to winning his bet to manufacture the least expensive trains in the world! Its train sets were the commercial driving force behind Jouef. In 1963, the first battery-operated set had the Diesel shunter and cost only 15 FF. One could acquire the Orient-Express train with transformer for 78 FF. As for the clockwork trains, they started at 9,75 FF: always at unbeatable prices! After the adoption of plastic in the 1950's, the second revolution at Jouef occurred at the beginning of the 1960's. The brand quickly scaled the pinnacle of success, crushing its competitors on the way and also found time to diversify into the field of slot car racing. In a few short years, it had become the largest industrial railway model firm in France whilst still developing the toy train market for children. Several technical and commercial choices contributed to this incredible success. The firm produced smooth running realistic track with plastic sleepers which in 1960 replaced the old tinplate track with printed ballast, which looked a lot like the old Hornby Dublo clockwork track. 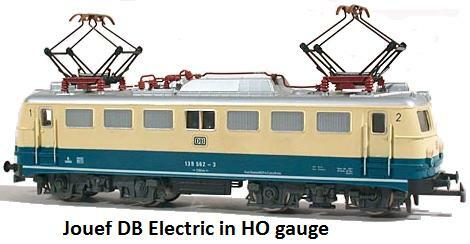 From 1961, it adopted a 12 volt DC system and in 1962 gave up its original coupling to adopt the Märklin system, which was to become the European standard. It also engaged in a policy of expansion of the range of models which made large investments necessary. This was made possible thanks to the use of inexpensive manufacturing techniques. There was a systematic use of plastic and widespread standardisation of parts hence assembly was easier and quicker. Additionally a trade agreement with Mettoy/Playcraft ensured a significant market for the Jouef products on this side of the channel in Playcraft Railways, whilst Jouef took on the distribution of the celebrated Corgi Toys in France. In addition, Jouef reacted incredibly fast to the contemporary railway scene - In a very short time they managed to produce models of the most recent SNCF trains - whilst still being seen to be attentive to the wishes of model railway enthusiasts. This is borne out by the regular comments in the letters pages and the great reviews of the time (RMF, Loco-Review, I'independent du Rail). Last but not least was the attention to detail in respect of the different liveries of the railways, an area sometimes neglected by its competitors. The railway station known as "Maintenon", which was first introduced in 1956, remained in the catalogues until the end of 1990, proof of its enduring quality. During the 1960s, Jouef marketed a limited range of British outline model railways under the brand name 'Playcraft'. Jouef also made many special accessories and a fine range of model buildings (initially manufactured under licence by the German firm Pola/Quick, before purchasing the molds of the French artisan André Porte, in 1967). These strategic decisions meant that Jouef faced the weakening competition represented by JEP (definitively out of the race in 1964), Gégé (with less developed operations) and especially Hornby-Acho, the brand launched with great success by Meccano in 1960 to establish a new range of HO models. It would be the end of the 1960's before more foreign brands, especially Lima and Fleischmann represented a real danger. During the 1960's there was a continual confrontation between Jouef and Meccano. Hornby Acho undeniably had the upper hand until 1965 by introducing an astonishing quantity of beautiful models based partly on the old SMCF brand name, but Jouef then took and held the advantage. When Hornby Acho woke up in 1965-1969, it was already too late. Its ageing models and its expensive manufacturing techniques could not resist the power and the will of Jouef. At the beginning of the 1970's, Jouef definitely outclassed Hornby Acho in the variety of its catalogues and its realism, which from now on would stand comparison with the best foreign productions. The only fly in the ointment was the electric motors. In 1964, Jouef had to abandon the faithful "saucisson" can motor. Although it was reliable, had a low power consumption and was very quiet it was too cumbersome to be fitted to scale models. Unfortunately from that point Jouef motors became infamous for being noisy and unreliable. The commercial war between Jouef and the Meccano-Tri-ang group found new ground with the slot car circuits. The success of Scalextric and its competitors (the Circuit 24, Le Miniamil, Mille milles...) pushed Jouef into the arena for Christmas 1963 with a first series of sets made in co-operation with the British manufacturer Playcraft, the model racetrack system later entitled "Record 64". Which a few years later became "Record 68". This name was changed into Circuit Routier Electrique at the end of the sixties. Jouef very quickly understood that it was useless to try to compete with Scalextric on the grounds of high quality top-of-the-range toys. Its slot car circuits were thus supplied and sold in the popular stores and through mail order catalogues. In this way sales soared and the products reached the customers quickly to eliminate the Circuit 24 and its imitations. Most replicas (the scale varies from 1/35 to 1/43) were from France origin, such as Renault, Matra and Ligier. Lastly, Jouef and Meccano were also in competition with 1/43rd scale diecast miniature cars and the fight was ferocious between Corgi Toys and Dinky Toys. But it was necessary to wait until the mid-70's before Dinky Toys, little by little, laid down their arms. The actors Alain Delon and Robert Hossein were used to promote the products of Jouef. At the beginning of the 1950's Jouef had broken new ground in French model trains with a number of new models, for example the Trans-Saharan and the Paris-Rome sets... But the HO scale models of the 1960's were without doubt more enduring. In December 1969, a giant exhibition of "the most beautiful toys of the world" was organized by Radio Télé Luxembourg (RTL) at Le Bourget airport, near Paris and was a splendid success for Jouef, whose range of models on show was superb - as were those of Meccano and Tri-ang. And this was emphasised by the designer Philippe Valois. The star of the show was the brand new 2-8-2 steam locomotive Class 141R, which, without stalling, hauled a train of 34 covered bogie wagons up a gradient of almost 5% (1 in 20)! The last great model of the "George Huard" period was the 4-8-2 Mountain Pacific Class 241 P steam locomotive which was released at the beginning of 1971. The model was voted overwhelmingly by the railway modellers as having correct scale, correct lining, fine lettering and a quiet motor which was both flexible and powerful (and all for only 86 FF!). It was destined to be one of the greatest commercial successes of Jouef. In 1972 when its founder George Huard, sold Jouef to Sofinex (a subsidiary company of Crédit Lyonnais) model trains entered a period of maturity and the sales of Jouef were at an all-time high. Crédit Lyonnais then decided to create a vast group, called "Le Jouet Français", by amalgamating three of the companies which it owned i.e. Jouef, Heller and Solido. Monsieur. Léo Jahiel and subsequently Thomas Sébestyen took on the presidency of the group. 1973 was mainly devoted to the consolidation of the range of trains. The oldest models were withdrawn from the catalogues, as were the narrow gauge trains originally made by Jouef and Egger-Bahn. At the same time, a number of locomotives were re-vamped with more detail, which gave them a new lease of life (BB9288, Capitole, CC6505, CC40101, CC7107, BB13001). Other new items included the beautiful Pacific 231K 82 steam locomotive in green & black livery and theCC5561 'Maurienne' electric locomotive, which despite having a super-detailed body was still mounted on the incorrect bogies from CC40100. After Meccano had given up the manufacture of Hornby-Acho trains at the beginning of the year, Jouef found itself having a virtual monopoly in the then flourishing toy train market. 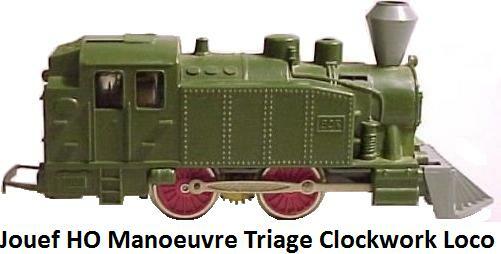 Its French competitors (GéGé, Troby, Lima) only made trains in the larger scales ('O' gauge and above) and the other European manufacturers (Märklin, Fleischmann, Roco, Rivarossi Trix etc) concentrated on so-called top-of-the-range HO gauge trains. The Champagnole-based firm, whose headquarters were in Paris, thus experienced a period of exciting growth. The number of models increased, the overall quality improved and the prices remained reasonable. In 1974 Jouef released the BB15005 in green livery and BB15006 in red and silver livery; a splendid rake of four modern SNCF Eastern region suburban coaches and the BB 67407 diesel locomotive. This replaced the original version (BB67001), which was withdrawn in 1964 and was definitely past its prime. In 1975 a version of the 141P steam locomotive, at this time considered to be perhaps the most beautiful steam locomotive from Jouef, was released and of a rake of SNCF-liveried OCEM coaches of riveted construction. The following year, Jouef produced the Turbotrain (or RTG }, a spectacular rake of five vehicles, unfortunately very noisy and without interiors, as well as the BB17029, a nice model of a locomotive well known to commuters. The year 1977 was particularly fertile with many innovations but quality control appeared to be a problem. A rake of 75 Corail coaches, three beautiful PLM coaches and a further Pacific steam locomotive 231K 72 with an ex-PLM 30A tender, were produced. These were well received by the modellers of the time, but not the CC 21004, which although it had a well-detailed body was mounted on the same ubiquitous incorrect bogies fitted to the CC 40100. However, for the first time, Jouef provided a detail pack with the STEF refrigerated van such that the purchaser could add the accessories to it (ventilators, ladders etc). Finally, the "Telecommande" system was re-named "Jouefmatic 76" and improved so as to operate with the recently introduced five pole motors. "Shiny wheels, an absence of concessions to scale, more often than not converted interiors, coloured plastic bodies not painted (how detrimental it was to see the light shining through the semi-transparent sides of a model equipped with interior lighting)..." such were the defects constantly picked up by the model railway press, which however underlined the progress Jouef had achieved with regard to lettering, painting, the respect of scale and, not least, accuracy of lettering and bogies. There are of course exceptions, like the Esso bogie tanker, produced in the same year, which looked more like a toy than a true scale model, but still cost 25 FF! The performance of the motors in the locomotives was not without criticism. In view of the weak performances of certain models, such as the steam locomotives 150 X and 150 044 DB they were withdrawn in 1978. Certain collectors even came to regret the passing of the good old "saucisson" can motor from the 1960's! Jouef models also suffered quality control problems and it was not unusual then to get a poor model (e.g. with defective painting, twisted accessories, traces of adhesive). It would be a long time before Jouef produced fault-free models for the market place. Jouef was at its peak in 1977. Its catalogues contained a remarkable abundance and variety of models and the company employed 1352 staff. Following the arrival of the designer Alain Pras, the range of modular buildings was re-vamped. By selective use of these the enthusiast was able to create a very convincing urban scene (1979) and the addition of the spectacular Châteaulieu station (1980) completed the picture. However this period was not without problems and "Le Jouet Français" did have some failures. Aside from the small poor quality 0-6-0 TB Boer tank loco (which went with the two old-timer 4 wheel coaches), other examples come to mind - the twin X4700 railcar (nicely lettered but lacking lighting), the small CC61004 diesel loco, (correct lettering and good performance) and the first South-Eastern TGV (the model was rushed out to be the first on the market). Not forgetting that even the beautiful 4-6-4 U class 232 steam locomotive was handicapped by its poor motor, unworthy of such a model, whose price was however comparable with that of the products of Märklin or Fleischmann. There was also a doomed attempt to sell imported British white-metal kits in '00' scale and a similarly doomed attempt to enter the British market by manufacturing in Ireland. In 1979, Jouef opened a factory in Limerick, Ireland, but the ill-fated venture closed in 1981. At this time Jouef was controlled and directed by bankers, who did not see the forthcoming changes in the toy market. Whereas its competitors produced top-of-the-range models intended for modellers, Jouef continued to develop hybrid trains, something between the toy and the true scale model. Youngsters abandoned Jouef models and turned to other playthings, while the demanding model railway enthusiasts hardly found Jouef of sufficiently high quality. Jouef had always tried to sell its products through the hypermarkets, and had for a long time neglected the sales of accessories through the small retailers, department stores and bazaars. But in particular the financial difficulties of Sofinex brought about the fall of the group 'Le Jouet Français', mainly due to foreign competition in the model market of the time, dragging down the balance sheet at its headquarters, Jouef ceased trading in 1981. After a long period of uncertainty, the Jouef name was finally rescued again by the CEJI group (a giant in the toy industry which also owned Joustra). There followed a new fruitful period under the chairmanship of Mr. Vuillard, the leader of Joustra. For the first time since the departure of George Huard, a true professional of the toy industry was in charge at Jouef, and he was surrounded by a dynamic team. Marketing was not now viewed as the priority. From now on, the desires of the modellers, the pleasure of conceiving and of making beautiful models took precedence! A number of interesting models then followed: the beautiful blue three car railcar X4923, a very beautiful BB27 electric locomotive, a new version of the Picasso railcar which finally replaced the veteran of the 1960's and the South-Western 141 MT steam locomotive. Jouef acquired some tooling from a company called France-Trains, a semi-professional modelling firm whose coaches were considered amongst the best on the market, but who went out of business. 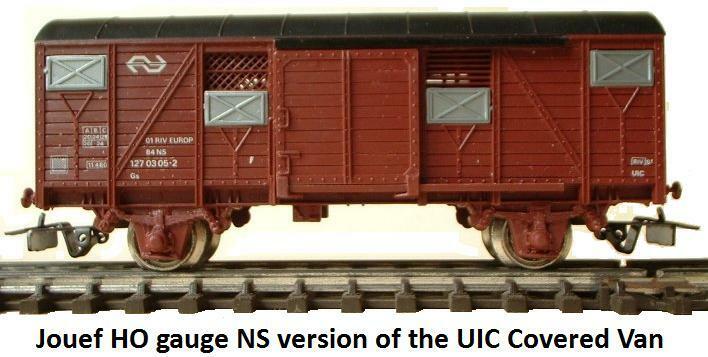 These were used in the later production of CIWL and OCEM coaches in the Prestige series. They also temporarily re-introduced the Egger-Bahn range, this time with new Mabushi motors. In parallel, CEJI benefited from the commercial muscle of Joustra to impose the presence of Jouef in the larger market place, and henceforth they took off. Diverse "adventure" train sets then ruled the day (Pirate, Action City, Lucky Luke) joining the fine tradition of the first clockwork trains of the 1950's. Jouef also sold other foreign manufacturer's electric trains: Ibertren (Spain), Lima and Rivarossi (Italy) and Liliput (Austria). The economic crisis, which struck France at the beginning of the 1980's, badly affected the toy industry, which was faced with terrible competition from Asian products and video games. Following the bankruptcy of the CEJI group, in 1985, the Jouef factory at Champagnole closed its doors and all the personnel were laid off. Certain model railway enthusiasts despaired, even proposing to launch a national fund to save the company. In fact, a saviour came from Jacques Barret the old friend and collaborator of George Huard. After having left Jouef, Barret founded the Fobbi mark, with the acknowledged objective of making toy trains in parallel with Jouef which had abandoned this part of the market. It finally bought out its competitor in 1986, and decided to concentrate the whole of the production on the site at Champagnole. The standard of the first models launched by the new company (the BB22200 and the Bugatti railcar) hardly managed to rise to the level of the German competitors but the situation changed quickly under the control of Jean-Pierre Coron, who took over the reins at Jouef after the death of Jacques Barret in 1987. The "Jouef Challenge", launched by the chairman of Jouef Industries in 1987, perfectly symbolized the enthusiasm of the new company. From November 24, the Museum of Science and Industry, in Paris, displayed a giant model 200 m2 in area representing a map of France. Traditional railcars, trains and the new Atlantic TGV traversed this romantic Hexagon. while Corsica was logically traversed by a narrow gauge train - Egger-Bahn. The TGV Atlantic, followed by the Spanish AVE and Eurostar, spearheaded the attempt by Jouef to re-capture the model railway market; beside primary series models and train sets, which the shops sold out of at Christmas, these new prestigious models were indeed sold in "enthusiast" versions and were very detailed. 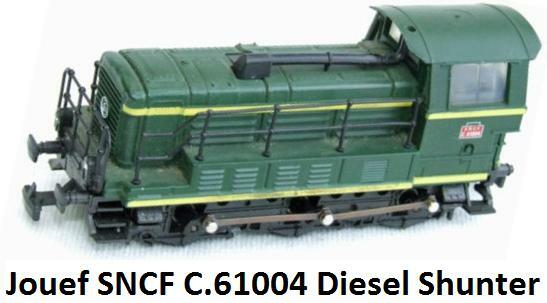 The new CC72000 diesel loco (which cost 1,100 F, (much to the great displeasure of the aficionados of Jouef, who were not used to such prices), the CC21000 and the Bo-Bo Sybic were the stars of a range now mainly renewed. 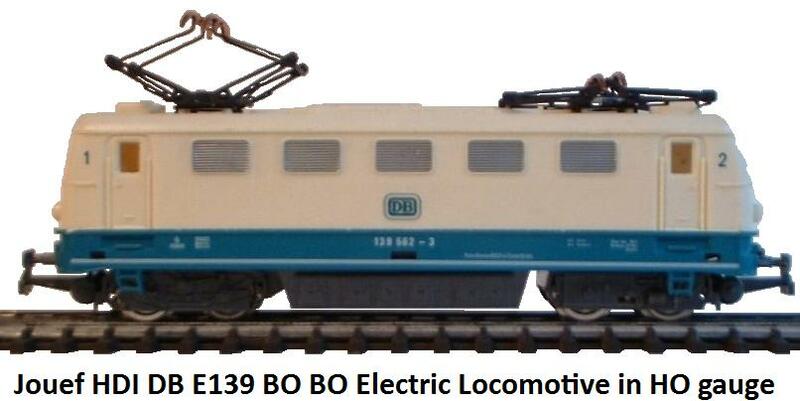 Removed from the range by 1991, the Sybic, in particular, was as good as anything produced by Märklin. This superb model also marked the return of metal in Mazac and some parts in brass which came to underline the quality assurance now in place from the technicians at Champagnole. The beginning of the 1990's therefore saw an definite improvement in the products of Jouef but, on the other hand, the price of the models reached or often passed the 1000 FF (over £100) barrier. However they did not abandon the younger children, which Jouef tried to attract with the primary series of small trains and with a new range of train sets. Thus, " My first train set ", with its shunting loco and stock, offered much more play possibilities than a TGV going round and round a circle of track... If they sold 130,000 TGV sets per annum, " My first train set " sold 35,000 train sets in the first year. And from all the other products which Jouef distributed in France: Scalextric slot car racing circuits (even though they were the principal competitor in this field! ), Revell plastic kits, Matchbox cars, etc. which really pushed Jouef into developing its commercial links with the rest of Europe. They even entered into a partnership with Hornby to distribute its Eurostar model in the UK. But Jouef's fragile financial situation was brutally revealed in 1995: the receiver was brought in and the firm was the subject of several proposed buyouts. The Slovenian company Mehanotehnika and Hornby were in the market as was the UP International Group but they could not find the necessary finance and as for the American toy giant Mattel, it renounced the buyout of the Jouef corporation - "a lot too French" according to the MD of Mattel-France, Robert Gerson. However, in November 1995, the business of manufacturing "model railways" was finally resumed by the Italian Rivarossi group, already owner of Lima and Arnold. 60 jobs (out of 156) were retained at the Champagnole factory with a plan to increase this to 90 in January 1998. In a concern about profitability, the management decided to cut back on the contents of the catalogue, which then contained nearly 500 items, some of which had first appeared a quarter of century previously. In an attempt to quickly catch up with the other group brands some Jouef models (BB17000 and Inox coaches DEV AO) for example were simply abandoned in favour of equivalent models in the Lima or Rivarossi ranges. Jouef had a definite leaning towards scale models and abandoned Mehanotehnika. Proof of this new commercial thinking was the appearance in 1997, of the first train set comprising the BB66400 diesel locomotive and four wagons as a true 'scale model', that is to say fully detailed and in an authentic livery. In 1999, BB 36000, the last locomotive designed and produced in the Champagnole factory, was recognized as the most successful Jouef brand model. Despite some disasters, such as the poor motors in the first series locomotives BB66400, Jouef undertook to rejuvenate the range, revamping certain older models in several different liveries, following current practice of German firms. The BB66400 was thus issued as early as 1997, with several different running numbers, soon followed by the CC6500 electric Maurienne or the CC72000 diesel. They were both considered by others to be the benchmark of real progress in decoration and engineering. Some of the new liveries necessitated the manufacture of completely new molds. This meant considerable expense for models which were likely to have only modest sales. (In the first year, 3,000 models of the Sybic were sold, a model nevertheless more successful than its competitor Märklin!) The work of the Jouef technicians always produced magnificent results, for example the CC21002 (withdrawn in 2000) or the very beautiful Astride locomotive, now highly prized. Jouef's new position in the market was mid-way between the top-of-the-range Rivarossi and Lima, and little by little this was shown to be a catastrophe for the French brand. The Italian group gradually abandoned the general model railway market to specialize in a range of high specification models. People were falling over themselves to buy Rivarossi, Austrian Roco or German Fleischmann and Märklin, without any thought for the numerous French craftsmen at Jouef. Therefore, the turnover from the hypermarkets fell by 11 million FF to 2 million FF, and without this income the management failed to invest the necessary funds for the scale models (the high cost of the molds was unlikely to be absorbed in the long term or by a long production run). In a perhaps hopeless attempt to regain the interest of children and youngsters, in 2000, Jouef launched the "Junior" range, which offered 16 models all from the same source, made using extinct Lima tooling and pancake motors. Although less detailed that those of the normal range they were nicely decorated and carried several different running numbers. The same revival of assorted train sets in new window box lids included the original 0-4-0T locomotive which had not been seen in the catalogues for nearly 10 years! In spite of this last ditch attempt to put off the inevitable the distressing story of the Rivarossi period is not all black. Jouef had hauled itself up to the level of the best foreign products, not only in regards to the accuracy of reproduction, but also on the technical level. But at the beginning of 2001, Jouef was losing more than a million Francs a month. According to the terms of a communiqué from the managing director, "Jouef is in a serious financial and commercial position". On 1st June 2001, the 'Idée Commercial ll ' corporation (the new name for the Rivarossi group), announced the closure of the Champagnole site (once again employing more than 60 people) and the transfer of its activities to Italy. Despite strong protests during the summer of 2001, the molds effectively left France. The factory was closed in September 2001 and all production was transferred to the Rivarossi factory in Isola Vicentina near Vincenza with the administration HQ at Brescia, Italy. However Jouef models were confined to the toy end of the market but some of the range was sold under Lima and Rivarossi branding. Due to overwhelming financial difficulties, Lima S.p.A. shut down all manufacturing in January of 2004. In December 2004 Hornby announced that it had completed the acquisition of certain assets of Lima S.p.A. Hornby re-located the manufacturing and assembly of the Lima & Jouef products to China. Hornby has managed the outsourcing of its own manufacturing and assembly processes to China successfully as well. 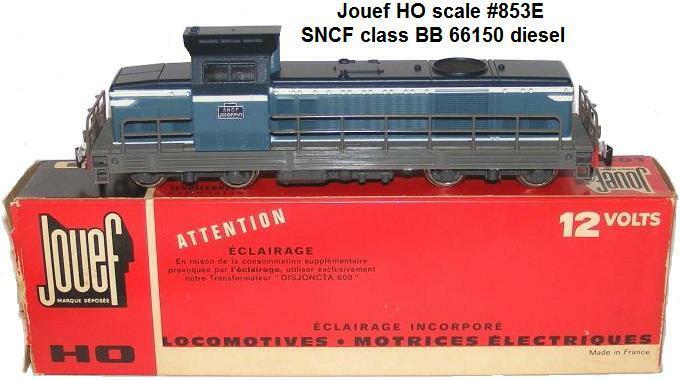 Hornby modified the Jouef brand to consist exclusively of French railroad equipment in HO gauge. By 2006 the Jouef line was revived and many of its famous models were again made available. In 2009 Hornby produced a separate catalog of Jouef products. Under Hornby's ownership Jouef has continued to produce quality products for model train hobbyists and consumers. Recently manufactured products have been recognized by several trade publications and been given awards. In 2011 the French railroad modelers organization Fédération Française de Modélisme Férroviaire gave model of the year awards at a Paris ceremony to Jouef for the 141 R 840 Mikado Steam Loco, 2D2 “Femme Enceinte” 5542 Electric Loco and the 030 TJ steamer. In 2013 Hornby France received 3 Le Rail d'Or awards from the French magazine Le Train for producing the Jouef 2d2 5400 Loco in HO, the Jouef Fret Express in HO gauge, and the Arnold X 73500 in N gauge.